Kuala Lumpur, Malaysia -- US President Barack Obama called attention to to the plight of lesser-known refugees Saturday during a visit to a non-governmental educational centre in Malaysia, noting that accepting refugees is not inimical to national security. Obama met with several refugees from Myanmar, Sudan and Somalia at the Dignity for Children Foundation on the outskirts of Kuala Lumpur. "The world is rightly focused on the humanitarian tragedy taking place in Syria, but we can't forget that there are millions of other refugees from war-torn parts of the world," he said. "In fact, 60 million people are displaced all around the world." Obama downplayed fears that refugees could pose security problems for the host countries following the Paris terrorist attacks last week. "When I sat there and talked to them and they were drawing or doing their math problems, they were indistinguishable from any child in America," Obama said after talking a Rohingya refugee from Myanmar. "The notion that somehow we would be fearful of them, that our politics would somehow leave them to turn our sights away from their plight, is not representative of the best of who we are," he said. Obama said the United States "has shown that we can welcome refugees and ensure our security - that there's no contradiction." A 16-year-old refugee from Myanmar gave Obama a hug before he left the centre. 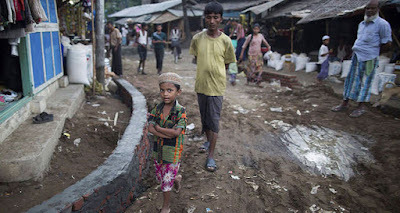 The United Nations High Commission for Refugees Commissioner for Refugees said there are 153,850 refugees and asylum-seekers in Malaysia from Myanmar, Sri Lanka, Pakistan, Somalia, Syria, Iraq, Iran, Palestine and other countries. Obama arrived in Malaysia on Friday to attend the two-day Association of South-East Asian Nations leaders' summit, which started Saturday.